Echo Bridge Home Entertainment specializes in bargain-priced catalog title reissues, and this month they brought several interesting films to Blu-ray for the first time (including Hellraiser: Deader). The jewel of the May, 2013 batch is Stephen Frears’ 1990 crime drama The Grifters. Not for nothing did this neo-noir (produced by Martin Scorsese, who adds a snippet of uncredited voiceover at the beginning) receive four Academy Award nominations. It was director Frears’ first Best Director nod. Screenwriter Donald E. Westlake was honored as well for his hard-boiled dialogue. Everything about the movie oozes an uncomfortable aura of sleaziness. 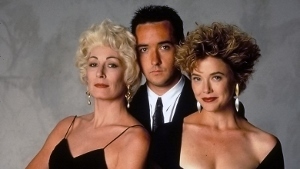 It’s a story about con artists, focused on Roy Dillon (John Cusack), his mother Lilly (Anjelica Huston), and his girlfriend Myra (Annette Bening). The plot is rather straightforward, more interested in these unsavory characters’ behavior than the mechanics of their schemes. Lilly is employed by an imposing bookie named Bobo (Pat Hingle), tasked with placing large bets on longshots at the track in order to artificially skew the odds. Again, the hows and whys of such a practice are less important than the fact that she lives in constant fear of Bobo’s wrath. More or less following in his mother’s footsteps, Roy set out at a young age to become a grifter. He specializes in short cons. He believes that swindling small amounts of cash allows him greater control over his life. He’s probably right, but he eventually discovers that Myra is a long con artist. We see a complex scheme she was involved in via flashback, really the only time The Grifters delves into The Sting-type territory. As Myra’s influence becomes stronger, Roy’s previously controlled life (which was never that well-controlled to begin with) spirals. Add in the fact that his mother’s skimming from Bobo has begun to catch up with her. By the time we reach the climax, each of the leads’ true colors emerges. These are soulless, selfish people. Frears and Westlake shine a spotlight on their amoral interactions. Huston and Bening are both sensational and each received an Oscar nomination. Cusack is great too, capturing Roy’s immaturity to a tee (not to mention his skin-crawlingly confused relationship with his mother). Nearly a quarter century later, The Grifters is a bracing character study. The downside here is a rather shoddy 1080p transfer that is marred by too many dirt specs and soft images. Don’t get me wrong, it’s an acceptable upgrade over the old DVD. It’s mainly that a cleaner source print was needed. Close ups and some medium shots are reasonably crisp, but wider shots are a tad soft and exhibit inconsistent grain levels. The 2.0 DTS-HD MA soundtrack will come as a disappointment to anyone hoping for a 5.1 mix, but it’s a good representation of the film’s original sound design. Elmer Bernstein’s icy cool score has never sounded better. No new extras are included here, but several carry over from the DVD. A commentary track featuring Frears, Westlake, Cusack, and Huston is included. There’s also a pair of featurettes – a pretty decent ‘making of’ and a look at Jim Thompson, author of the novel of the same name (upon which the film was based). Highly recommended for fans of pulpy crime sagas.